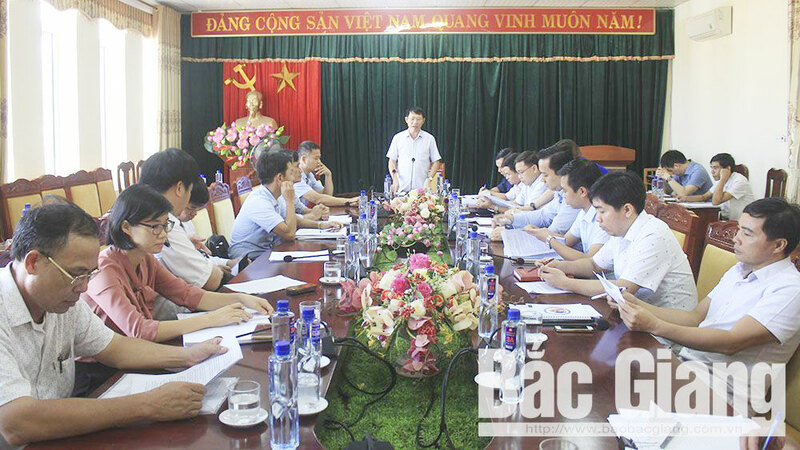 (BGO) – Le Anh Duong, Vice Chairman of the Bac Giang provincial People’s Committee on August 22 paid a field trip to Yen Dung district to inspect the task of dossier making, health examination and management for the locals. He was accompanied by leaders from the departments of Medical, Information and Communication, Finance and Bac Giang branch of Viettel Military Industry and Telecoms Group (Viettel Bac Giang). Vice Chairman of the Bac Giang provincial People’s Committee Le Anh Duong (center) works at Yen Dung district People’s Committee. Implementing the plan issued by Chairman of the provincial People’s Committee about dossier making, health examination and management for the residents, the district authority instructed the Medical Centers in the district, communes and towns to establish the Steering Boards with specific tasks assigned to each member as well as skills of information review and collection, dossier record, software and data management among others carefully trained. To the end of July, the district completed examining 91.8 percent of the first group (children under 6 years old without attending the kindergarten, the elderly, retired people and free labors and other cases) as well as 79.6 percent of the third group (public servant, staff and officer and enterprises’ employees). The data has been currently inputted by the localities. As of August 16, more than 10,000 health records were created, accounting for 20 percent. Vice Chairman Le Anh Duong inspects the health record-making at Medical Station in Neo town. Concluding the meeting, Vice Chairman Le Anh Duong highly spoke of Yen Dung district’s creative method in collecting the information and creating the profile while suggesting the district to select suitable period to conduct the last examination to the second group (students in high schools, vocational training – regular education centers; children under 6 years old in kindergartens) and actively communicate to the locals for further understanding and execution. The district People’s Committee was urged to issue the specific guidance, mobilize the manpower and volunteer, promptly train the skills for the medical staff and officers so as to complete the data input this year. Besides, the Medical Department should check up the equipment system in the communal medical stations and propose the proper plan of supplement and reparation. Meanwhile, Viettel Bac Giang will revise the data input software to be more suitable with other software for health examination and management from the Medical sector. Previously, the delegation inspected the facilities in Nham Son and Neo town. (BGO) – Implementing the public health record, the Medical Center in Yen Dung district, Bac Giang province has organized the health checkups and profile management for over 80,000 people in the first group (kids under 6 year-olds without attending the kindergarten, the elderly, retired people and free labors) at 21 communes and towns in the district, accounting for 86 percent of the group since May 2018. 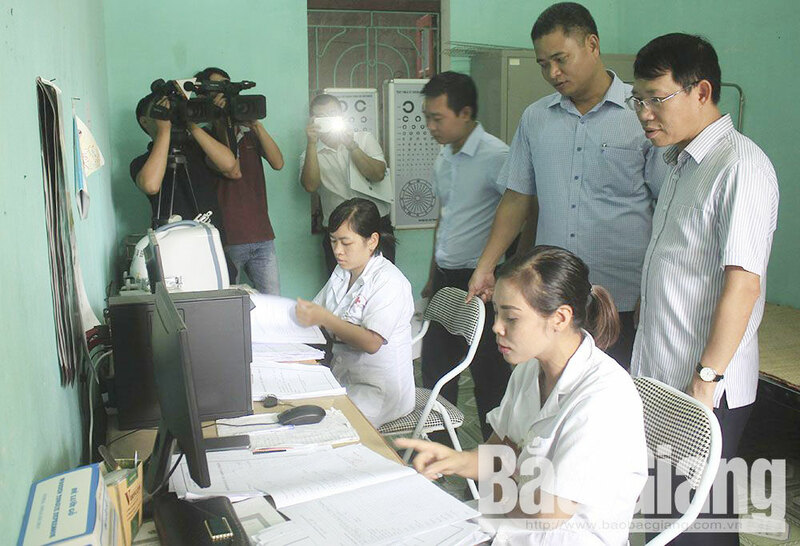 (BGO) – Recently, the localities in Yen Dung district (Bac Giang province) have focused on propagandizing and checking to list the groups of the subject to organize the medical examination and make the dossier of health record for all residents. (BGO) – The northern province of Bac Giang piloted making documents, examining and creating personal health records for all people residing at Yen The district in 2017. Basing on the achieved results, the competent departments and sectors have carried out the task in other localities, striving for 100 percent of local habitants to complete the electronic personal health records before 2020.